Director – Al Adamson, Screenplay – William Pugsley & Samuel M. Sherman, Producers – Al Adamson & John Van Horne, Photography – Paul Glickman & Gary Graver, Music – William Lava, Visual Effects Design – Bob Le Bar, Electronic Effects – Ken Strickfaden, Special Makeup – George Barr, Art Direction – Ray Markham. Production Company – Independant International. Singer Judith Fontaine’s search for her missing sister leads her to a pier freakshow run by the wheelchair-ridden Dr Durea. Dr Durea is in fact a descendant of the Frankenstein family and is injecting his dim-witted assistant with a serum in order to turn him into a monster and is then using him to collect victims for his experiments in revivification of the decapitated. At the same time, Durea is coerced by Count Dracula into helping him revive the original Frankenstein monster. Dracula vs. Frankenstein comes with one of the great title confrontations of all time. It is a title that Universal in their various monster team-ups of the 1940s – Frankenstein Meets the Wolfman (1943), House of Frankenstein (1944), House of Dracula (1945) and Abbott and Costello Meet Frankenstein (1948) – somehow overlooked. And it was a popular idea too – there were two other films using the same title conflict that appeared around the same time as this – the Spanish Dracula vs. Frankenstein (1970) starring Michael Rennie and Paul Naschy, a film even more pitifully bad than this, and Jesus Franco’s Dracula vs Dr Frankenstein/Dracula, Prisoner of Frankenstein (1971). In terms of delivering on its title challenge, Dracula vs. Frankenstein is a thoroughly wasted opportunity. It is not just what an incredibly shabbily made film it is – it’s that Dracula and Frankenstein seem to be irrelevant to the plot, which is more about a girl searching for her missing sister who has been abducted into a mad scientist’s scheme. Dracula and the Frankenstein monster only appear sporadically. Both at least have a tussle at the climax to justify the title but it is poorly motivated confrontation. The rest of Dracula vs. Frankenstein is a mess. It is badly directed and the plot is a haphazard jumble (not surprising considering that it originally started out as a biker film and was turned into a monster bash to capitalize on the early 1970s classic monster revival). It is, for example, impossible to work out what Dr Durea’s mad science scheme is trying to achieve (something to do with decapitating and then reviving young women from the dead), while the science that J. Carrol Naish spouts is complete nonsense. It is sad to watch genre veterans like an aging and wheelchair-ridden J. Carrol Naish and an alcoholically wasted Lon Chaney Jr (in his last performance) reduced to playing in such impoverished surroundings. Famous Monsters of Filmland (1958-82) editor and fan legend Forrest J. Ackerman is credited as technical advisor and has a small part as a doctor victim, something that shows he should stick to editing. 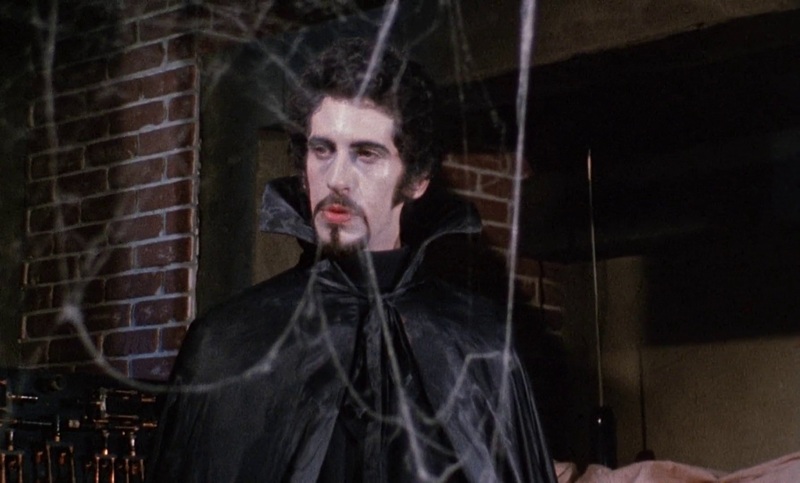 Zandor Vorkov gives a performance that verges on the somnambulistic, lazily blinking his way through the entire role, making possibly the worst screen Dracula of all time. Director Al Adamson became famous for his extremely cheap exploitation films. Adamson made a number of genre films including Satan’s Sadists (1969) about a sadistic motorcycle gang; Blood of Dracula’s Castle (1969); Horror of the Blood Monsters/Vampire Men of the Lost Planet (1970); the Filipino mad scientist/monster movie Brain of Blood (1971); Blood of Ghastly Horror/The Fiend with the Electronic Brain/The Man with the Synthetic Brain/Psycho-a-Go-Go (1972); the softcore sf film Cinderella 2000 (1977); Death Dimension (1978), an action film with some sf elements; the possession film Nurse Sherri (1978); was co-director of Dr Dracula (1980), which is confusingly actually about the reincarnation of Svengali; and the bizarre children’s film Carnival Magic (1981) about an intelligent circus chimpanzee. Al Adamson is one director whose body of work could well outstrip Edward D. Wood Jr in terms of sheer shoddiness.